When the 2017 -18 Stampin' Up! Annual Catalogue was released, one of the stamp sets that caught my eye was the "This Little Piggy" set on page 48. As many of you know I love to colour, and I could imagine this set done in watercolour and this is what I came up with for my daytime class. 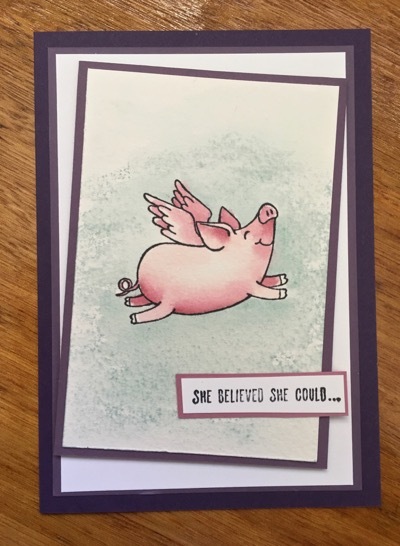 I've used a couple of easy water colour techniques on the card, and found this card to be a good one for technique revision because we included masking as well. 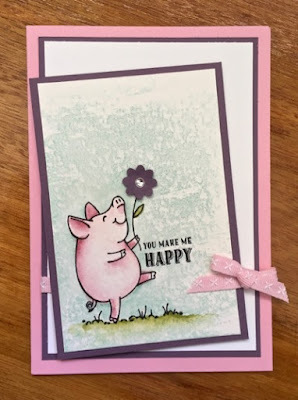 Start with stamping the piggy outline in Archival Black on Water-colour Paper. Stamp the same image onto a Post It note and cut out just inside the outline. (Cut inside the line to eliminate the white shadow that occurs when stamping around a mask). 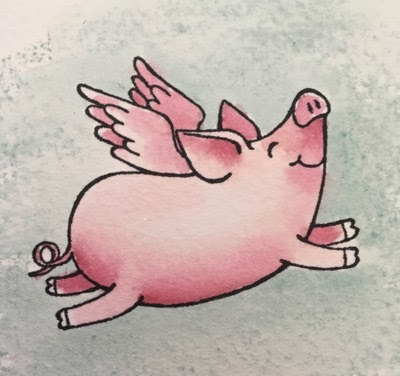 Place the mask over the stamped image of the pig, and ink up the Watercolor Wash stamp set. I don't bother to mount the stamp on a block as I want the background to be a little uneven and I achieve that look by just pressing the stamp down with my fingers. Remove the mask and use an Aqua Painter to colour the pig - I used Blushing Bride and Sweet Sugarplum ink for the pig and a little Pear Pizzazz for the grass. Build up your layers of ink to get nice depth in the shadow areas. Punch out a small flower and raise it on a Mini Dimensional with a Rhinestone in the centre. Touch up around the edge of the pig with the Aqua Painter and mat as desired. Here is another image using all the same techniques, but different colours. 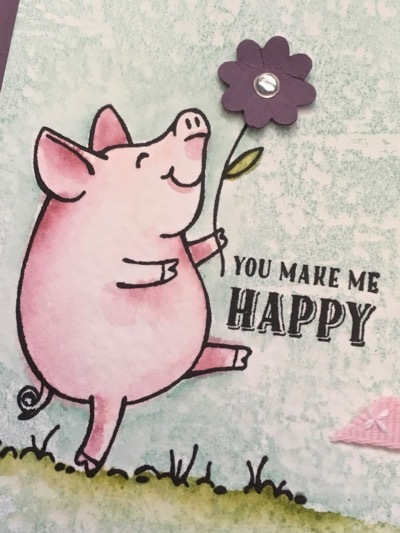 What a happy little piggy! Supplies are listed below. You can purchase any you need via my on-line store if you live in Australia.